Your own piece of lakeside vacation living awaits! RV park lot is available in the highly desirable Twin Echo Shores Resort – includes 29′ travel trailer & storage shed! 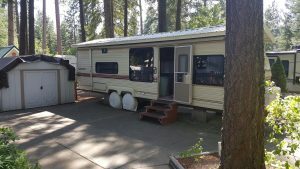 The 1989 Layton travel trailer by Skyline Celebrity Series is in great condition & is well maintained-only lightly used for personal family vacations. Trailer features metal roof, A/C, full kitchen, fridge, oven/range, full bathroom with bath tub & shower, living room with TV & sleeper sofa. Bedroom has 2 sets of spacious bunk beds. Sleeps 7-8 people! Detached storage shed for additional storage included. Wifi available. Gated park,guest showers, community beach & boat launch use included! Call 208-661-4749 today to set up a showing.